An exploration of 10 famous Rhode Island foods that every local and visitor should try. For such a small state, Rhode Island is surprisingly big on food. The birthplace of New England favorites like stuffies and johnnycakes, the Ocean State also boasts quite a few of its own culinary specialties, totally indigenous to its tiny corner of the world. Learn about these and more as we highlight our top 10 favorite Rhode Island foods and where to get them. Prepare for lots of New England flavor and seafood, lots of clams, heaps of tradition and plenty of delicious excuses to pack up the car and go. If you thought fried calamari was already addictive, you haven’t tried it Rhode Island-style. Made with squid freshly fished from the surrounding waters, the crispy battered rings and tentacles get a flavor boost from a quick toss with garlic, butter and the vinegary kick of pickled cherry peppers. From the mouthwatering first whiff to the savored last bite, the dish is completely hard to resist and so revered that it was named the official state appetizer of Rhode Island in 2014. Hemenway’s, Providence. This classic Rhode Island seafood restaurant is consistently ranked among the top spots for calamari. It’s central location to Providence attractions including the RISD Museum and the Rhode Island Convention Center makes it even more appealing. Twin Oaks, Cranston. Bringing a friend to Twin Oaks to try the calamari is kind of like saying “try my mom’s.” Family-owned since 1933, it’s been around long enough to feel like family. The waterfront views aren’t bad either. The Capital Grille. Good news for anyone who can’t make it to Rhode Island every time a calamari craving strikes – the Capital Grille serves Rhode Island-style calamari at its locations across the county as a nod to its roots at Union Station in Providence. A staple of Rhode Island’s many beach and roadside clam shacks, these fried dough fritters are crispy on the outside, soft on the inside and traditionally stuffed with meaty Rhode Island quahogs (aka the state’s official shellfish). They are best served hot and often come beside a bowl of Rhode Island clam chowder (more on that later), in which they are ideal for dunking. Aunt Carrie’s, Narragansett. 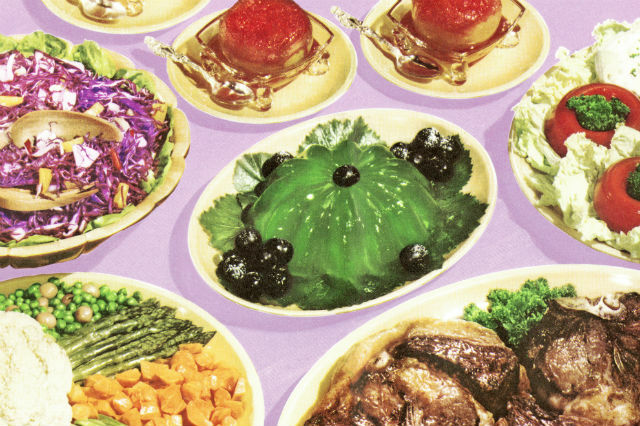 Some say that Aunt Carrie was the inventor of clam cakes, but there is no hard evidence to prove it. No matter what, it’s a local favorite near the beach. Open seasonally. Monahan’s Clam Shack, Narragansett. Another casual walk-up shack, located on the Narragansett seawall. You can’t beat clam cakes and chowder while watching the sunset over the water at one of the outdoor tables on a summer night. And don’t forget ice cream after! Open seasonally. We told you there were going to be a lot of clams on this list. And no list of Rhode Island foods would be complete without mentioning stuffed quahogs, affectionately referred to as stuffies by the locals. Baked and served on the half shell, these clam shack favorites are typically made with a mixture of celery, onions, clams, bacon, breadcrumbs, chopped clams, clam juice and seasonings. Every place has their own spin; the fun part is trying them all. Anthony’s Seafood, Middletown. Anthony’s serves both hot and mild versions made with either roasted or cherry peppers. Like many variations, the stuffing includes Portuguese chourico sausage, influenced by Rhode Island’s large Portuguese population. Amaral’s Fish and Chips, Warren. Fresh and simple. If you’re looking for a taste of the classic, try these. Flo’s Clam Shack, Middletown (Clam Shack) and Portsmouth (Drive-In). The stufffies here are known to be so big that they need to be contained with a rubber band. Both locations are open seasonally. Unlike creamy New England clam chowder or the tomato-based Manhattan version, Rhode Island clam chowder has a clear broth, putting all of the focus on the clams (quahogs, of course!) Big chunks of tender potatoes, herbs and bacon make up a hearty bowl of what may very well become your new favorite type of clam chowder. Evelyn’s Drive-In, Tiverton. This clam shack on Nanayuaket Pond serves all the staples, including this local favorite. Matunuck Oyster Bar, South Kingston. A bowl of chowder is always a good place to start before sampling some of the freshest shellfish around. The oysters at Matunuck are fished right from the waters of the restaurant owner’s nearby oyster farm. Hot wieners, also known as New York System wieners, are what Rhode Islanders crave. Served at diners throughout the state, they are more than your average hot dog; in fact, you’re better off not calling them hot dogs at all. And don’t put ketchup on them either. These small sausages made with pork, veal and spices are typically ordered “all the way,” with onions, yellow mustard, celery salt and a seasoned beef sauce. 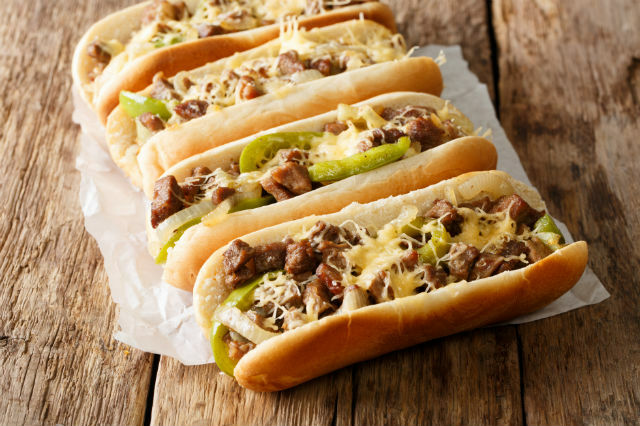 Grillers traditionally prepare them by lining rows of buns and wieners up their forearms and methodically piling on the order of toppings. 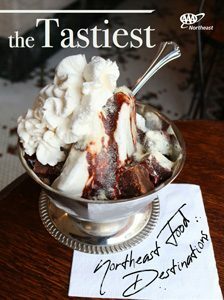 Wash it all down with a cold glass of coffee milk (keep reading to learn more) and you’ve got quintessential Rhode Island late-night munchies. Olneyville New York System, Providence and Cranston. Winner of the James Beard Foundation America’s Classics Award in 2014, Olneyville sets the standard for hot wieners. Open until 2 a.m. Sunday-Thursday and 3 a.m. on Friday and Saturday. Wien-o-Rama, Cranston. Another sure bet to satisfy your hunger pangs all day and late night. A hot wiener’s best companion. Yet another one of the Ocean State’s “officials,” the designated state drink of Rhode Island is one that not too many people have heard of elsewhere, at least by the same name. Like chocolate milk, coffee milk is made by stirring coffee-flavored syrup into milk. 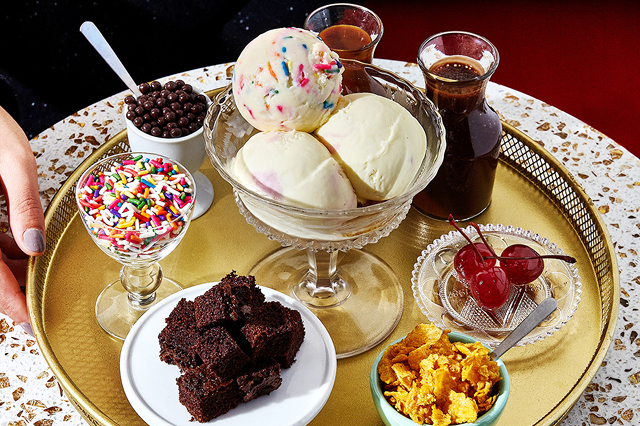 Add coffee ice cream to the mix and you have another uniquely Rhode Island beverage: the coffee cabinet. Try one of the milkshakes at Newport Creamery locations throughout the state where it is called an Awful Awful or at Delekta Pharmacy in Warren, which has been serving the treat at its soda fountain for over 100 years. At most diners/hot weiner spots…like Olneyville New York System. Make it yourself. 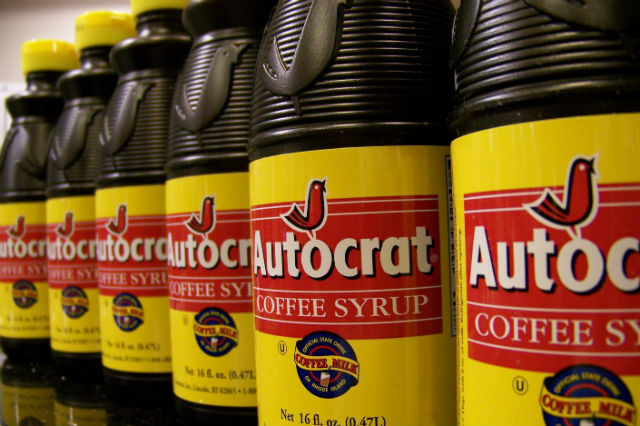 You can purchase coffee syrup in most general stores and supermarkets throughout Rhode Island. Autocrat and Eclipse are the most famous brands. 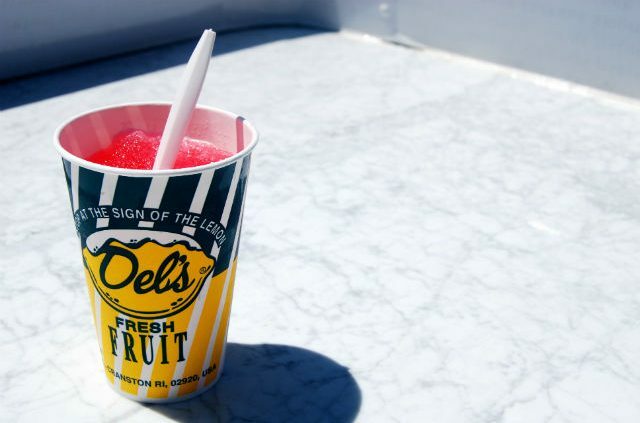 Where to try it: In the summer you can find Del’s stands and trucks all throughout the state. Most are only open seasonally, but there are some brick-and-mortar locations, like this one in East Providence with hours year-round. Rhode Island’s version of a zeppole or beignet, a doughboy is simply a square of dough that’s been fried and dusted with either granulated or powdered sugar. Best enjoyed still warm from the fryer. Available at pizzerias and clam shacks throughout the state. Iggy’s Doughboys, Warwick and Narragansett. There will be a line but the locals will tell you it’s worth it. Available year-round in Warwick and in the summer in Narragansett. Often the most anticipated guest at any Rhody get-together, some might say that it’s not a party without pizza strips. Unlike traditional pizza, this unique-to-Rhode Island specialty is sold at bakeries and features a thick, airy crust topped with tomato sauce and not much else, except for maybe a sprinkle of parmesan or herbs on top. There’s no mozzarella cheese on this pizza. Palmieri’s Bakery, Johnston. A staple of children’s birthday parties, cookouts and game nights, D. Palmieri’s “party pizza” is in the highlight reel of many Rhode Islander’s most memorable moments. De Petrillo’s Pizza & Bakery, with locations in Coventry, Warwick, Smithfield, Glocester. LaSalle Bakery, Providence. Pick up a box of zeppoles with your platter of pizza strips and you’re all set for a night of good eating. Rhode Islanders are passionate about all of their foods, but perhaps none are as hotly debated as johnnycakes. From how to spell their name (jonnycakes or johnnycakes?) to how to make them (milk or water), to whether they should be thick (South County-style) or thin (Newport County-style), the unleavened cornmeal pancakes are notorious for causing arguments. Two things are for sure – johnnycakes are a tradition that started with Native Americans and have been around longer than any of us, and whether you enjoy them like pancakes for breakfast, as a side dish with dinner or lunch, or even for dessert, they are delicious. Kenyon’s Grist Mill, Usquepaugh. Kenyon’s Grist Mill is the world’s largest manufacturer of Johnny Cake Meal. Try a sample on one of their tours or at the annual Johnnycake Festival in West Kingston. Commons Lunch, Little Compton. Crepe-thin is how they make the johnnycakes at this long-time establishment. What are your Rhode Island foods? Did you favorite make the list? Tell us in the comments! Article tags: car, dinner, england, food, lunch, newport, providence, roadside, the restaurant, tours. Matunuck Oyster Bar is the best restaurant in the state! I hear that from everyone! I have yet to visit … someday! Been to Rhode Island many times. Beaches, history, sailing, mansions, scenery, good food. Great place to live or visit.